[Satnews] The European Space Agency’s LISA Pathfinder mission is designed to pave the way for future missions to detect gravitational waves. RUAG Space has supplied many vital components, including highly precise mechanisms and electronic and electro-optical systems for this satellite, which is scheduled to be launched from the European space center in Kourou on December 2. 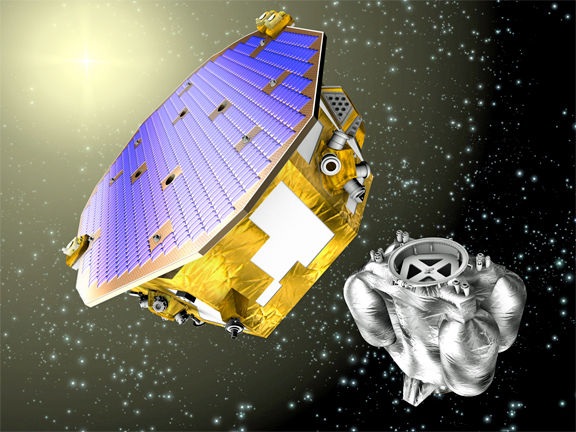 Artistic rendition of the LISA Pathfinder spacecraft. If scientists had a means of observing gravitational waves, it would give them a completely new perspective on the forces at work in the universe. After all, gravity is by far the most influential force in the universe. It is responsible for the birth of stars, galaxies and black holes and therefore ultimately for the evolution of the universe as a whole. It is almost a hundred years since Albert Einstein predicted the existence of gravitational waves, but so far no empirical evidence has been found to support this hypothesis. To date, none of the experiments that scientists have conducted on Earth have produced any conclusive results. The purpose of the LISA Pathfinder mission is to pave the way for a space-borne experiment to detect gravitational waves by monitoring the motion of defined test masses that are, from a physical perspective, in freefall. In other words, the only physical force acting on these masses is gravity. If gravitational waves really do exist, their presence ought to cause a slight change in the distance between the test masses. But this is very difficult to prove with certainty. It requires a detection system that is capable of measuring the distance between the test masses to an extremely high degree of accuracy, and an experimental setup in which it can be guaranteed that the objects are genuinely in freefall, and are not influenced by other forces such as charged particles energized by the solar wind. Photo is courtesy of RUAG Space. The actual detection of gravitational waves will be the task of the future eLISA mission. LISA Pathfinder, as its name implies, is a demonstrator designed to test the necessary technologies in a space environment. The aim of the LISA Pathfinder mission is to show that it is possible to measure the distance between two free-falling objects in space with the utmost precision using laser interferometry. Inside the satellite, two identical solid cubes made of a gold-platinum alloy, each weighing 1.96 kilos, float side by side at a distance of 38 cm apart. A caging mechanism supplied by RUAG Space holds the two cubes securely in place during the launch phase. 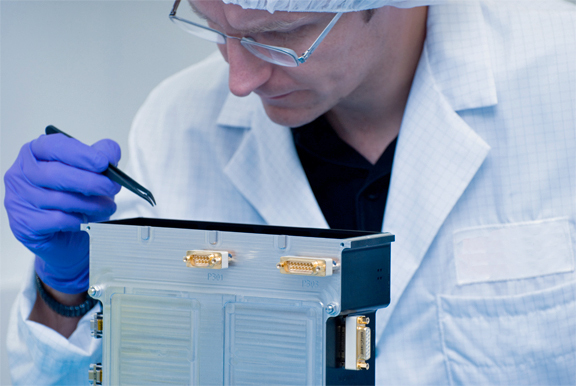 After the satellite reaches its orbit, a second highly precise mechanism supplied by RUAG Space carries out the delicate task of placing the test masses in free fall in their respective test enclosures. Once the two cubes are freely floating inside their enclosures, the distance between them is constantly monitored by a high-precision laser interferometer. This instrument bounces laser light off the highly reflective surfaces of the two cubes and measures the phase shift in the light waves caused by changes in the relative distance between the two test masses. It is so sensitive that it is capable of detecting changes in distance to an accuracy of 10 picometers (1 picometer = a millionth of a millionth of a meter). RUAG Space provided one of the components of this laser system: the laser modulator. Its function is to generate two separate laser beams at very slightly differing wavelengths. RUAG Space also worked together with the Swiss Federal Institute of Technology in Zurich to develop and build the electronic system with its capacitive sensors that measure and control the displacement of the test masses. The science module structure, made entirely of carbon-fibre-reinforced plastic, was also built by RUAG Space, as were the multi-layer thermal insulation panels and the heating elements that will be used to vary the temperature inside the spacecraft. The separation system to release the satellite from the launch vehicle was also supplied by RUAG Space.